Google Brings Feature To Search Images By Color ! Google Image search-google-in-reverse-order-funny-experience/">search brings now an updated and advanced new option to restrict the results based on their colors. However, currently this option is not available for you in the google-chrome-comes-with-real-player-in-bundle/">user interface, but you can tweak the search results URL to try it. 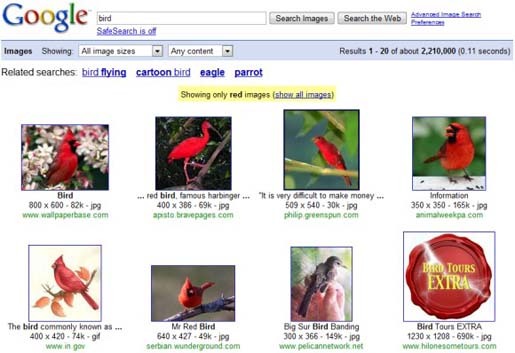 If you will search like Red Bird, you will have a how-to-filter-file-types-in-google-video-search-results/">good result but still if you will find some unrelated images in the search results. Still you want to have enhanced-google-search-results/">more exact results here is the URL given. Moreover, you can have different search results by replacing red in the given URL with whatever the color google-offers-free-offline-calendar-for-all/#more-6986">you want.